Going a little traditional today. I'm really loving the colors of this room, maybe its the fabric on the chairs that I like the most. Oh and the chandelier, that is a work of art! In other news, it's going to be 43 degrees here on Friday, I'm pretty pumped about that. And yes I know its sad when I get excited about 43 degrees. Yes, it is an very traditional space but it feels very updated! As you point out, probably due to the chandelier and print on the chair. It reminds me of a space I need to work on for a client...thanks for the inspiration! Yeah, loving that image. That chair fabric is fabulous! And I'm thrilled because it's supposedly going to be 60 here on Friday...don't worry, I'm not bragging, it'd been about 35 all month!! I can't hang anymore! Looks lovely- everything comes together so effortlessly. And I am beyond excited for 40 degree weather! How pathetic, haha! That fabric really pops! It adds some color to a very traditional room, yet it's fun, too. Oooooh! My eye first caught the gorgeous chandy...I love the chair fabric too...and the unexpectedness of it! I am in love with that rug! 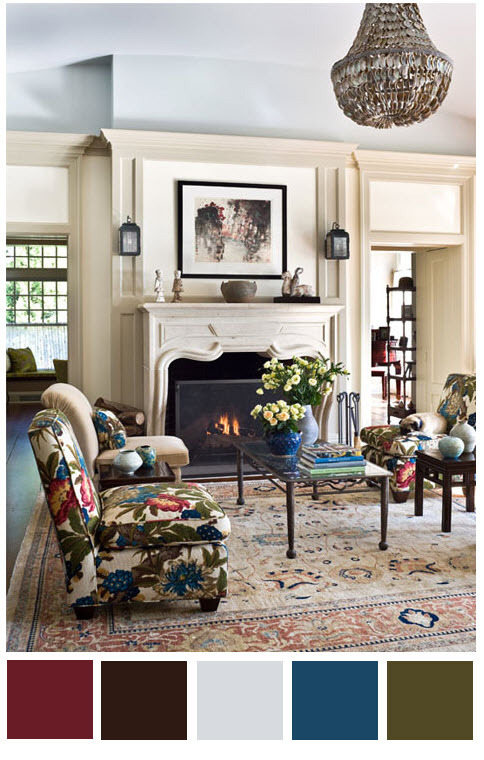 i'm so into fabrics like the one on the chair... kind of updated classics.. brighter & larger takes on traditionals... LOVE! without the bright fabric in the chairs and the blue on the table that room would be dullsville. but..it's not. that chair is awesome. I love when people use patterned fabric to cover furniture.